IS IT WORTHWHILE TO CONTINUE? In August, MIT researchers identified an exoplanet with an extremely brief orbital period: The team found that Kepler 78b, a small, intensely hot planet 400 light-years from Earth, circles its star in just 8.5 hours - lightning-quick, compared with our own planet's leisurely 365-day orbit. 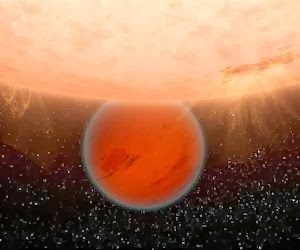 From starlight data gathered by the Kepler Space Telescope, the scientists also determined that the exoplanet is about 1.2 times Earth's size - making Kepler 78b one of the smallest exoplanets ever measured. Now this same team has found that Kepler 78b shares another characteristic with Earth: its mass. By analyzing the movement of its host star, Kepler 78, the scientists determined that the exoplanet is about 1.7 times as massive as the Earth. From the same measurements, they calculated that the planet's density is 5.3 grams per cubic centimeter, closely resembling Earth's density (5.5 grams per cubic centimeter). While its similarities to Earth likely end with Kepler 78b's size and mass, Winn says there is still more to learn about the planet, such as its surface and atmospheric composition - a goal that the group plans to pursue next.